You are browsing the archive for In the News. Minnesota Tornado Throws a Pickup Truck One Half Mile! The National Weather Service has confirmed that the tornado which touched down in North Dakota and traveled east into Wilken County, Minnesota on Saturday was rated a low end EF4. This means the storm had estimated peak winds of 170-175 mph. The link to the National Weather Service assessment of the damage. This was one of several tornadoes which touched down in Minnesota, North Dakota and Wisconsin on Saturday evening. This area was slammed by a violent tornado outbreak on June 17th of this year. A complete report on that outbreak can be found here. One tornado on Saturday was caught on tape by a storm chaser crossing a road and then destroying a building. According to the National Weather Service, about 14 buildings were destroyed by this twister. 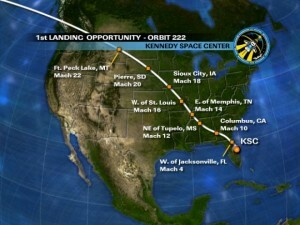 STS-131 will land at the Kennedy Space Center Monday morning. 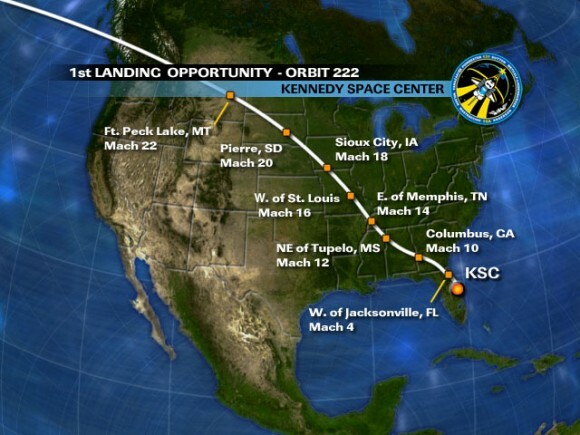 If the first approach goes well (orbit 222), the shuttle will track across the central U.S. and might be visible anywhere from Montana to Florida. In Missouri, the track goes from northern through eastern Missouri. It would be visible from the NE-E sky at about 18 degree above the horizon at about 7:32-7:33 am. HOWEVER, clouds will likely make viewing the shuttle very difficult! Even if the clouds clear, it will happen FAST as the shuttle will be traveling at Mach 16!!! More information from CBS News. 1:00 pm A weather briefing I give to my students at MSU. About ten minutes. 4-5 pm A chat room will be open and I will cycle through some maps. Limited live talking due to TV preparation but I’ll pop in from time to time! 6:30 pm Live from the Weather Lab! About half and hour. 11:00 pm The regular broadcast of “Upstream” from my house. Half hour or more. I attended the College of DuPage Severe Weather Symposium held from November 5-7 in Downers Grove, IL. Some background: the College of DuPage has the longest running, organized storm chase class which just passed its twentieth chase season. Other courses offered at the college provide beginning students of meteorology a “leg up” by providing valuable hands on experience. The program is headed up by professor Paul Sirvakta. Paul is a genuinely nice guy and great facilitator which is why the program is such a success. Many of you may know that Missouri State University offered a similar (at least logistically) chase class this past June ‘09. It is safe to say that the framework, it not the actual seed for the idea, came from the College of DuPage program. One of promoted items of the symposium was an early look at the results of the massive project Vortex 2 field study of tornadoes which occurred this past spring. Spring 2009 wasn’t a great year for tornadoes incidentally (I’ll have some exact figures in another post). In fact. during the six weeks of Vortex 2 operation, only one tornado was intercepted! But it was probed and measured by more radars and meteorological instrumentation than any tornado in history! While it wasn’t touched on much at the conference, there were other supercells in which data was collected that did not produce a tornado. These so-called “null sets” might prove valuable too in that one of goals of project Vortex is to figure out why some supercells which really look like they should produce a tornado do not. Another way of putting this is to talk about false alarms. The National Weather Service would really like to reduce, to as small a number as possible, the number of tornado warnings issued for which a tornado never forms. I remember well a night several seasons ago when a tornado warning was issued for Springfield and Greene County during the “prime time” evening hours. With sirens blaring, KOLR and KSFX provided continuous coverage of this storm as it passed into the warning area for about 30 minutes. As you might have already guessed, a tornado never developed. Oh, and that 30 minutes of coverage just happen to overlap exactly with a show, maybe you’ve heard of it, called “American Idol”! While there are many other factors which go into the warning decision process which will affect how many false alarms occur, a better understanding of tornadogenesis is certainly a very important first step. The speakers were all fantastic. Some were principle investigators with Vortex 2 namely Markowski, Rasmussen, Richardson and Wurman. Others provided great insight on understanding storm structure and forecasting severe storms. Perhaps the most unexpected and surprising topic of conversation centered around the increasing role of computer models in forecasting and the very real possibility that their continued refinement and improvement may lead to the demise of the human forecaster! In fact, there was an obvious tone that this was inevitable and that it was just a matter of time before it came to pass. Many suggested ways to stay relevant as a forecaster. While I can see a day of perhaps a reduced role of humans in forecasting, I can tell you from personal experience that the computer models have a LONG way to go before they can replace human forecasters, especially those with experience or during times of active or severe weather. I’ll likely have a few more updates as soon as I get a hold of some of the presentations. Tropical Storm “Ana”; Chased by “Bill”? 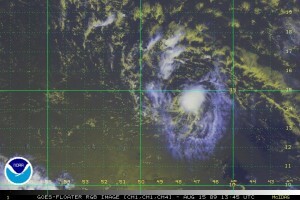 Our first tropical storm in the Atlantic has formed. “Ana” is what is left of Tropical Depression #2 which had dissapated but has now found new strength. Close on it’s heels, an area with a high probability of development might become tropical storm “Bill” before the weekend is over. UPDATE: TD#3 (“Bill” wannabe) on the morning NHC update. My blogs this week have been discussing these storms and their possible impact on the southeastern U.S. Long-range models continue to make the eastward system into a strong hurricane. You can view this for yourself. Go to this link, click on “10 m Wind” row and choose the column for the latest model run. “12z” uses data from 7 am local time and wouldn’t be available until about 5 hours after. Most mornings, you can use the “06z” data (1 am CDT run time) after 6 am. “z”, by the way, stands for “Zulu”; it is also called GMT or UTC, all of these simply refer to the current time in Greenwich, England at 0 degrees longitude. It’s a universal time which ensures that all weather observations are taken at the same time across the globe. It’s interesting that the 06z run curves this storm over the Gulf stream before hitting Florida and up toward New York and New England. Other runs have taken this storm into the Gulf of Mexico. My blog the other day discussed why these storms curve; in this case the jet stream disturbance which will drive yet another cool front through the Ozarks late this week will be the same one which turns this storm. If the model is right of course! Also, a great (and good-looking) site for tropical tracking can be found here.